We collectively are being steeped in mother love. Be it mother love from Mother Nature, a maternal mother loving you unconditionally, or feeling the feminine unconditional love of a friend looking you in the eyes and really seeing you, each of us is being held here on this planet together. 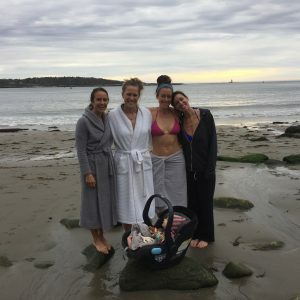 Earth Day just passed and we are rounding into Mother’s Day, so as a culture, we are being pulled to recognize a connection for life, creation, and nurturance. It is no coincidence that these two holidays are near and dear to one another. If we can step back and truly reflect on the gifts of our “mothers,” what a gift and an offering this time of the year can be for ourselves and everything that surrounds us to stand more knowingly into our own Mother Nature. Last week my husband and I, after 10 years of owning our home, officially opened up our “guest room.” For years it was a form of a garage, storage center, book shelf, goodwill heap, junk drawer. Wednesday evening was the grand opening of welcoming dear friends to stay with us. I put clean sheets on the bed, set out the towels, candles, flowers, and created a comfortable nest for landing. Having two boys of my own, the prep was very similar to how I folded onesies, made a crib, and arranged their rooms before birthing them and bringing them into our home and family. Wednesday evening we welcomed friends who have been in my life for over a decade. What followed was hours upon hours of conversation, connection, recognition, and heartfelt exchanges. We spent time in nature, walking, running, plunging in the cold ocean, and lathering ourselves with sugar scrubs and oils in the hot sauna. By opening our home, it was an invitation of nurturance and love to come back tenfold. My cup is full. My spirits are riding high. “To lift your spirits, spend time with Nature. 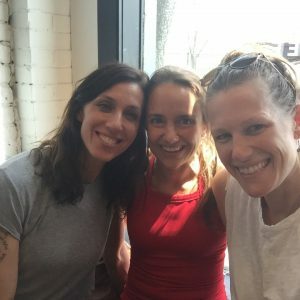 She will lend you her power until you become aware of your own.” Being both in nature as well in the presence of friends who humbly and authentically shared their true nature in such loving and honest ways, held the space for me too to settle into my own true nature. They reminded me of my capacity to love unconditionally; my capacity to embrace all life; to have patience; they reminded me of my strengths, power, passions and dreams. I am incredibly grateful and truly feel the fullness in my body, interactions, and communications. One of these lovely friends was my teacher, friend, mentor, Tracy Bleier. 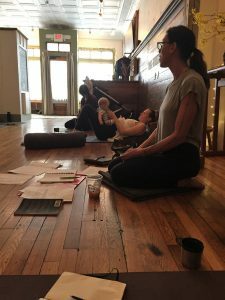 Some of you also were able to get a glimpse of the embracing and welcoming space shared by Tracy Bleier this past weekend in her workshops. 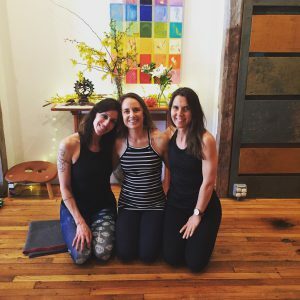 She created a container for all bodies to welcome themselves and settle deeper into feeling and knowing their own capabilities, a mantra she stated over and over for us all to hold and say to ourselves was “I am capable, I am capable.” Our bodies are capable of moving, capable of being, loving, healing, listening, sharing. She spoke a lot about nurturing, and questioning how do we nurture ourselves, truly. In our practice on the mats, are we creating more tolerance, or intolerance? Are we working with ourselves or against ourselves? She mentioned that instead of seeing alignment in just the physical form, to understand “alignment as the time and space when we believe in the gifts that we have to share in the world.” When we can settle into our own strengths, own power, own voice, this is when we are settling into alignment. As the Lao Tzu states, “Being deeply loved by someone gives you strength, while loving someone deeply gives you courage.” I 100% felt that sense of being deeply loved over the last few days. Quite similar to the way a mother looks their newborn in the eyes, seeing them for the first time. Loved, seen, and heard for the person I am and am becoming. She reflected back to me what she saw in me, without hesitation. My initial reaction was to just push her loving kindness away, but, as a practice I opened up and allowed for myself to hear, feel, and receive what she was saying and seeing. And what unfolded was feeling myself soften, feeling more ease, and a desire to deepen my connections with everyone around me. Truly. I have always marked myself as not really a “hugger” but over the last few days, felt compelled to hug those around me. As Lao Tzu states in his quote above, once given the strength, then pouring out the love from ourselves gives us courage. I had the courage to step out of the untrue mold and storyline I had created for myself that I was not loveable, huggable. I had more courage to slow down and look into people’s eyes (which, this is an incredible practice on its own, Tracy had us many times over the weekend see each other, it takes tremendous courage). On her empathic lead, she modeled concern, interest, and intrigue in my boy’s feelings and beings. I had the courage to be more patient and hold more space with my boys when they bubbled up with their fits of screaming, crying, whining. At one point over the weekend, Tracy asked me to read something in front of the group of teachers. I got butterflies, my negative self talk came up telling me old storylines of “I am not worthy, not good enough, there must be someone better suited to do the reading,” and so on. The reading was poignant and so spot on. It was all about having the courage to step into your own truth and nature. Like a mother bird would gently nudge her baby to the edge of the cliff for their first flight, she gently nudged me sweetly to jump off and go for the ride. It was beautiful. I am so utterly grateful for steeping in her presence, as well as my other loving and supportive friends and family who create for me a feeling of sustenance, nurturance, and being held by Mother Love. Love grows and expands. The more we get, the more we have to give. How do you see yourself held and supported by Mother Nature? What does support and sustenance look like to you? Who are your supports? What would it be like to fully nurture yourself through all the fluctuations of life? We would love to help support you all in having time to really nurture and love up on yourself so you can more easefully settle into your own true nature. Join us for practice, workshops, reflections, meditations. As an ode to Mother Love this month Skye will be offering a special workshop for women Awakening Shakti. Also, check out my video on how to bring in more self care and nurturance into daily living. Be well, live well, and love vibrantly.